CHART-topping band Union J have confirmed they are to switch on intu Trafford Centre’s Christmas lights. The four-piece boy-band will flick the switch on more than £1million worth of decorations on October 30 when thousands of shoppers are expected to descend on the Centre’s Main Stage for the special hour-long event. Then the ever-popular Gospel Choir will be setting the festive scene in the afternoon from 3pm, before the Main Stage event kicks off at 6pm. Richard Paxton, general manager, said: “We are delighted to have secured the fantastic Union J to kick-start our Christmas, and we’re expecting thousands of fans to come to one of the best free gigs of the year. 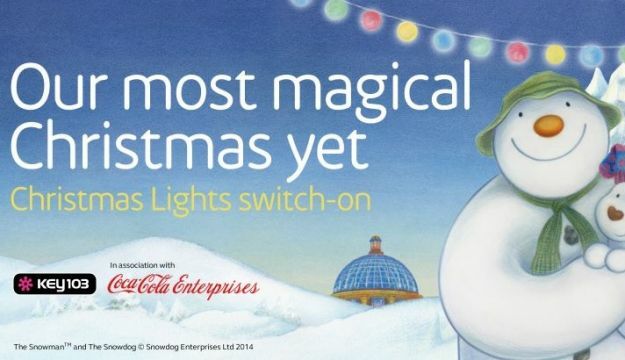 Also on stage will be the magical characters The Snowman and The Snowdog. They also appear in the Centre’s festive TV ads this year, and the award-winning grotto in Barton Square is expected to sell out as families enjoy a mini-theatre experience themed around the famous festive pair. “This year we have refreshed our illuminations with a really dramatic new Main Dome centre-piece – but of course some iconic favourites like the giant Santa Claus atop Barton Square tower and our singing Christmas tree will be making a return. The new Grotto at Barton Square will be surrounded by a host of festive stalls offering Gluewein and Bratwurst, gifts and sweets. The intu Trafford Centre Christmas Lights Switch On traditionally heralds the start of the shopping season at intu Trafford Centre, and is the earliest major illuminations display to be held in the region. Added Paxton: “Stores catering for fashion, gifts, electronics and homewares have now brought out their Christmas ranges, and our The Snowman and The Snowdog Grotto will open on Monday, November 3. One week later, our Day of Christmas Magic takes over the Centre, (Saturday, Nov 8) and that will see customers meet Santa Claus with his live reindeers, and watch as the magic of Hamleys takes to the Malls. “Our aim is to make intu Trafford Centre a must-visit destination during the Christmas season, and that starts in true style on Thursday, October 30. WHAT: The Christmas Lights Switch On 2014 at intu Trafford Centre, presented by Mike and Chelsea from Key 103. WHEN: October 30th – Gospel Choir starts at 3pm, with sets until 5pm, stage-show starts at 6pm, until switch-on with Union J at 7pm.